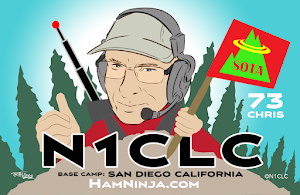 Join the San Diego SOTA Mailing List to hear about local SD SOTA events. LDG Z-817 auto tuner matched to 817 radio. Yaesu 857D is used by a lot of SOTA operators as a 100W rig. Shack in a box and goes from HF to UHF. Packtenna (love this little guy) The packtenna dipole is easier to work with than the MFJ dipole and it has clip-on for 40M so I didn't ahve to make one. MFJ-1910 33' mast for SOTA. It's light enough for hiking. I removed the first two elements as they are too weak to hold the dipople. Easy Digi interface for iPhone allows me to send PSK31 from the iPad as well. Chameleon verticle, dipole, end-fed combo. Research of multiple reviews shows this is mucho better than Alpha. A good compromise when you can't setup a dipole because of people or whatever. I want to do some testing with this from a mountain top. Not sure it is SOTA ready. Very well reviewed. Julian at OH8STN reviewed the Chameleon and Alpha and the CHA won hands down. Super Antenna - Well reviewed vertical antenna with adjustable tuner at the antenna. Buddipole - Portable, not sure the weight is good for SOTA but the later model has decent review from a guy in town. There is a person who doesn't like his older model. How to use SMS to self-spot.